I spent many days searching for this particular site. I knew which canyon it was in, but was still unable to find it. After a few trips to the area I was finally able to find these amazing pictographs with the help of a friend, and I realized that they were within my sight all the days I had missed them previously! This panel is located in a large alcove high above the canyon floor. It’s a bit of a steep scramble to get up there, but well worth the climb. 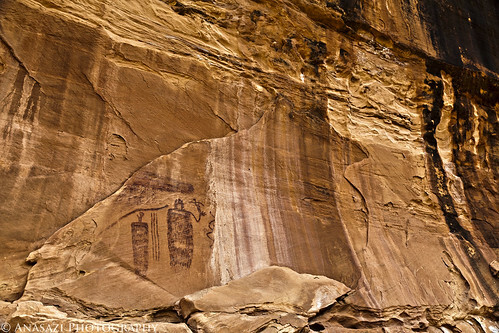 Once in front of the pictographs, you are treated to an excellent example of Barrier Canyon Style rock art. Inside the large anthropomorph’s mouth is a small blue snake from which this panel’s name derives. I will probably have to post a closer shot of this panel in the future for you to appreciate all of the finer details, but for now just enjoy the scene in it’s surrounding alcove.